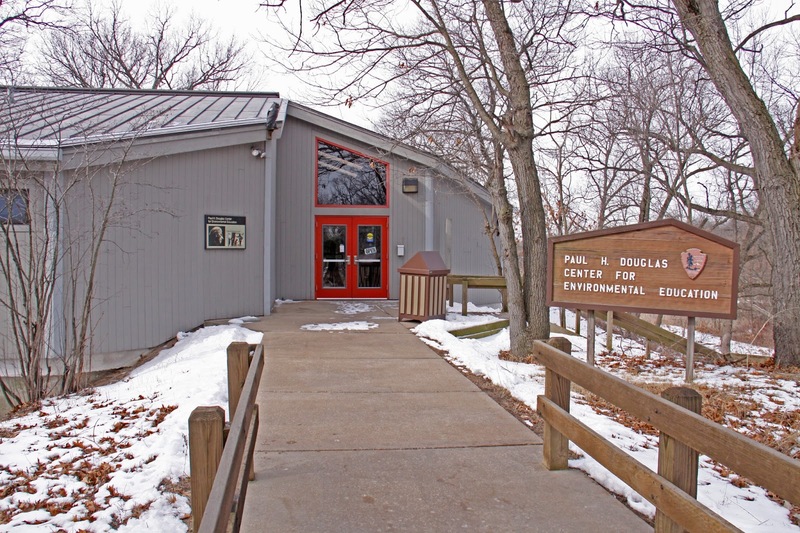 Paid another visit to the Paul H. Douglas Center for Environmental Education. 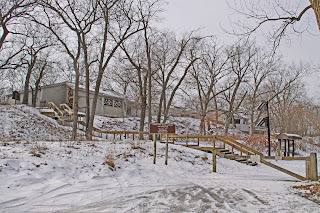 This time I hiked the Miller Woods Trail and the woods to the east of the main parking lot on Lake Street. Maybe a mile and a half in total. 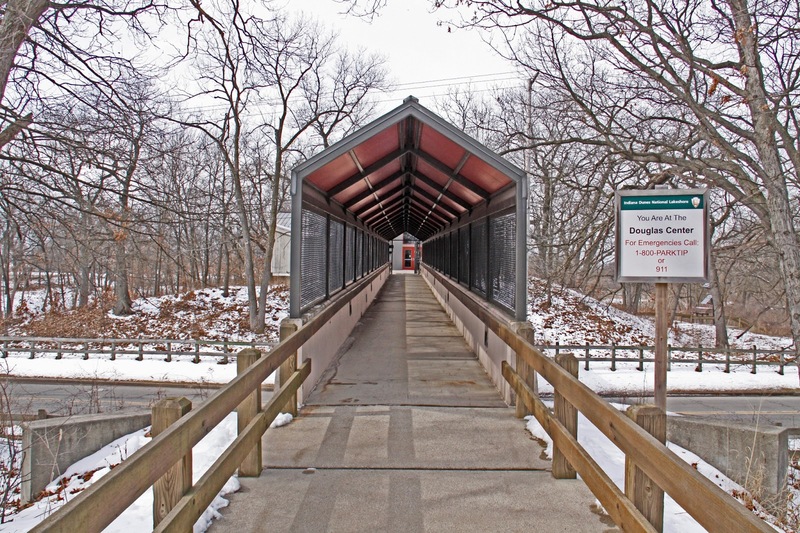 Covered Foot Bridge over Lake Street, from parking to the Douglas Center. 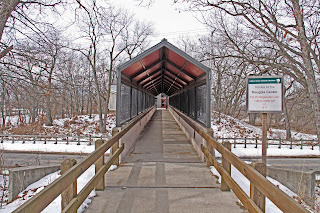 After parking in the main lot on Lake St. you walk over to the Douglas Center via the Covered Foot Bridge. 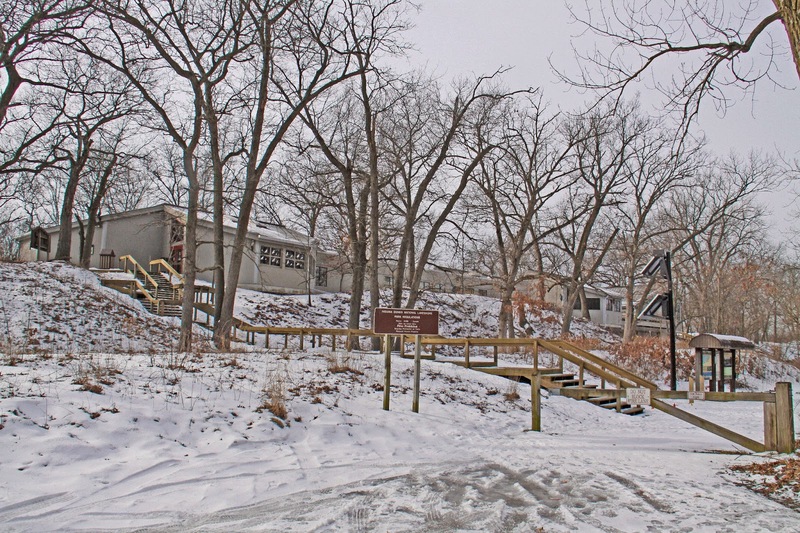 The Douglas Center for Environmental Education entrance. 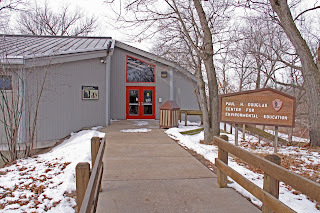 The National Park Service sign greets you and the entry doors are straight ahead of you. 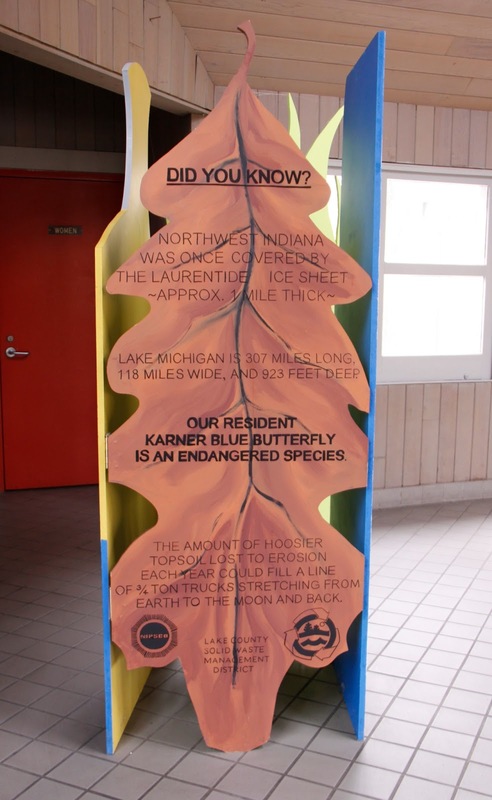 Interesting facts about Northwest Indiana. A display in the foyer of the Douglas Center lists some amazing facts about Northwest Indiana that I did not know. Douglas Center view from Lake Street West parking. 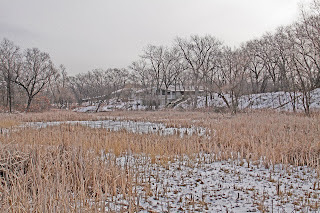 Distant view of Douglas Center from the Marsh Overlook Boardwalk. About a third of the way along the Miller Woods Trail is the Marsh Overlook Boardwalk that crosses the marsh north to south. 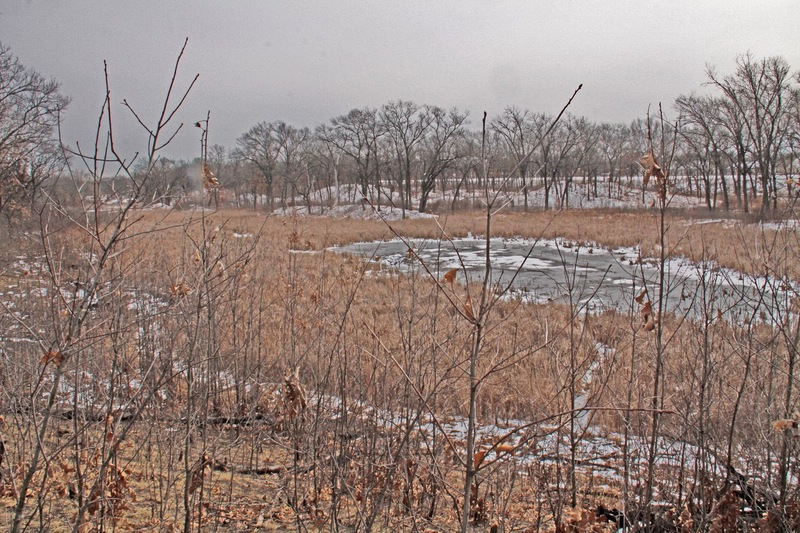 This is the view looking east, over the marsh. The Douglas Center can be seen in the distance. 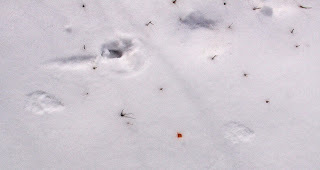 Canine tracks and blood trail in snow. 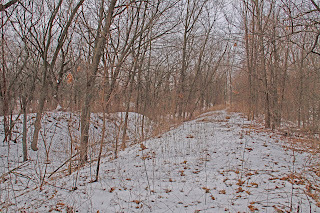 The trail was covered with snow that was a few days old. The snow was more ice than snow, loud and crunchy. Tracks of some type of canine could be seen and blood drops about every ten feet. Probably a dog walkers pooch nipped his ear on a brier thorn. 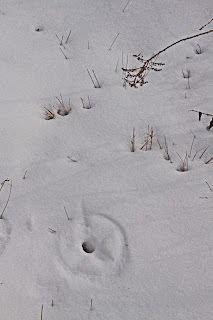 Opening in snow that lead to a small mammal snow tunnel. 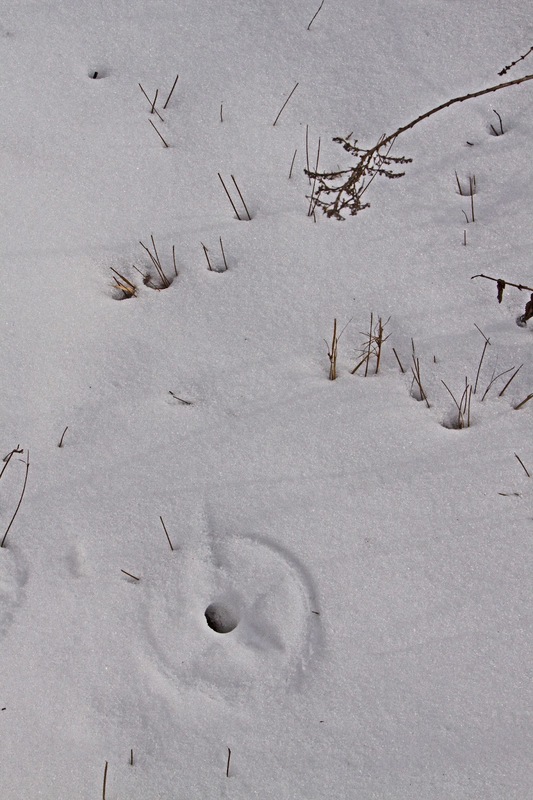 Field mice and voles tunnel under the snow and every here and there they poke through to the surface of the snow to check out their surroundings. 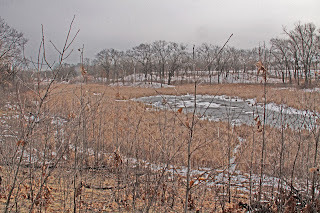 Western edge of Miller Woods Marsh. 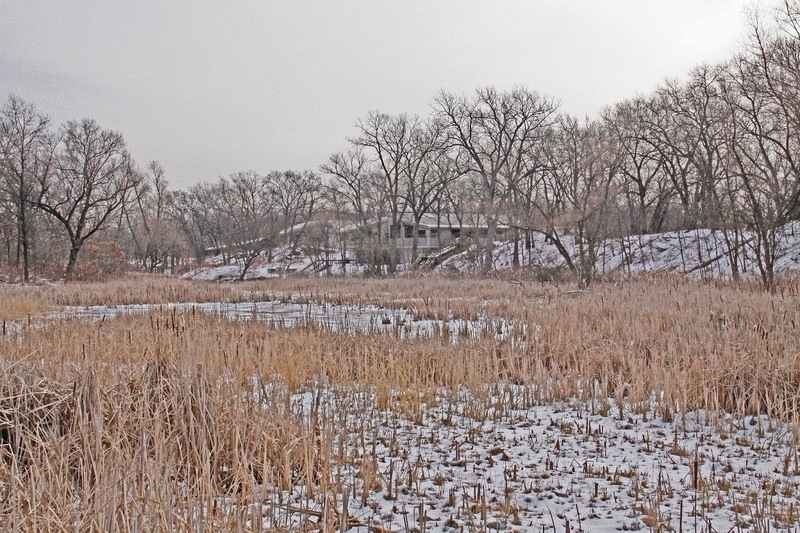 At the far west end of the trail is the edge of the marsh. 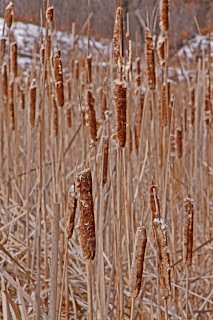 Cattails are the dominate vegetation in the marsh. 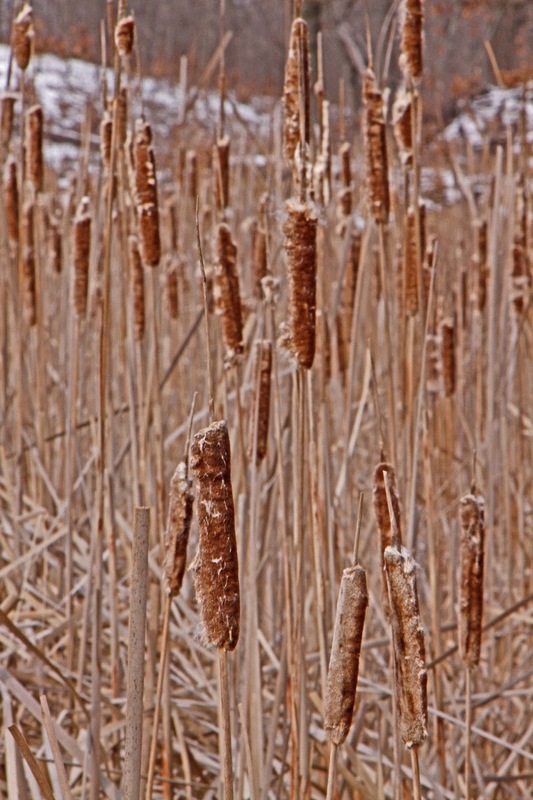 The seed head of the cattails, thousands of seeds attached to fur-like fibers that are dispersed by the wind if disturbed. 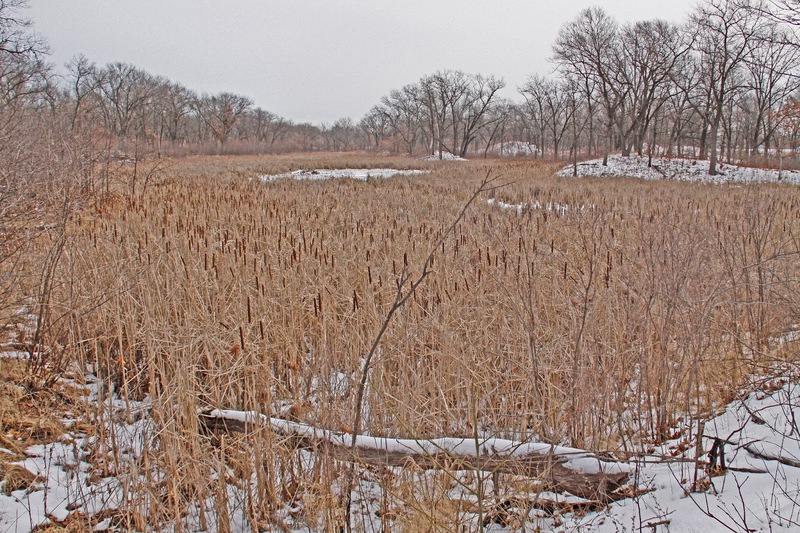 View of Miller Woods Marsh from a high dune. A high dune rises above the marsh. Notice how the growth of the cattails encircle the water in the middle of the marsh. 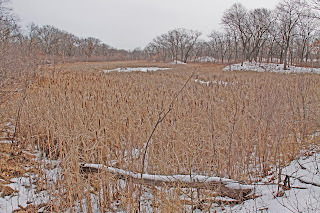 If the water level continues to drop over the years, eventually the cattails will die off and the marsh will become a wet meadow. 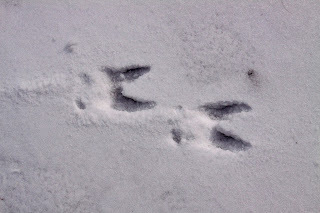 Deer tracks in snow, big Buck. Wasn't ready to quit, so I walked the woods on the east side of Lake Street. There I ran across these deer tracks. This deer was big, my guess would be a large buck. 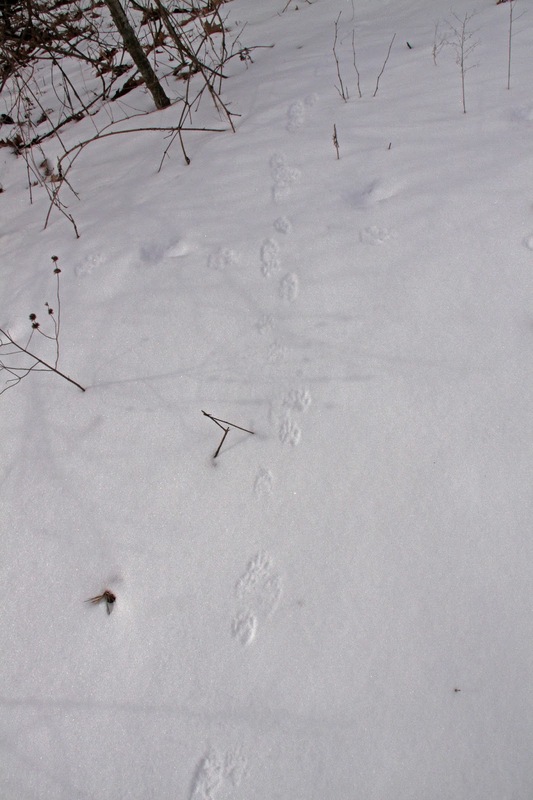 More tracks in the snow. I'll have to brush up on my tracking because I have no Idea as to what these my be from. A mystery, more than likely squirrel or rabbit. Scene in woods east of Lake Street. 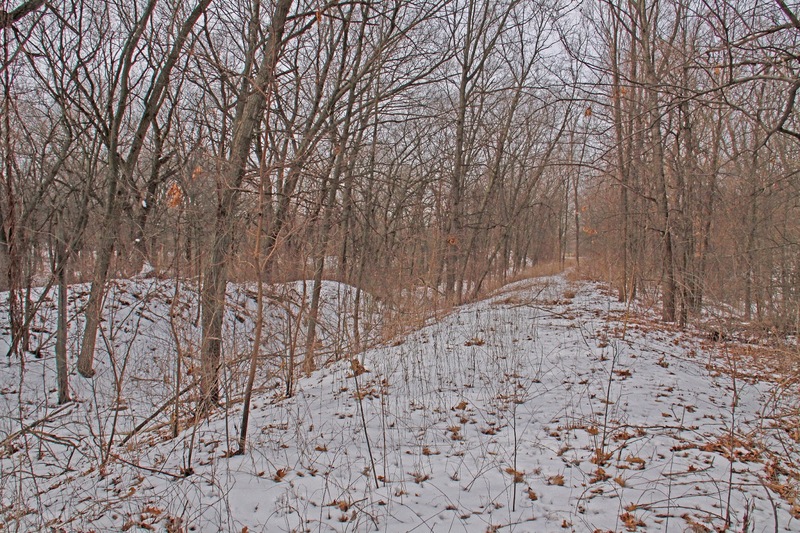 I walked an old railroad track bed from Lake St. to Grand St. A nice little dune woods and swales to the south. heading back to the Douglas Center parking lot now.